The days of holding just one job seem to be over. With the rising costs of expenses and living, more people have a harder time living off of one income alone. Moreover, many professionals find themselves under-employed, which also makes living on one salary difficult. Instead, they spend the majority of their day at their usual 9-5 job, and then proceed to go home and find other, alternative ways to make money. The reasons many people begin side hustles are obvious, whether you’re seeking to pay off debt, provide yourself with extra fun income, or increase your salary to save for a financial goal, money is the clear reasoning behind a majority of side hustles. 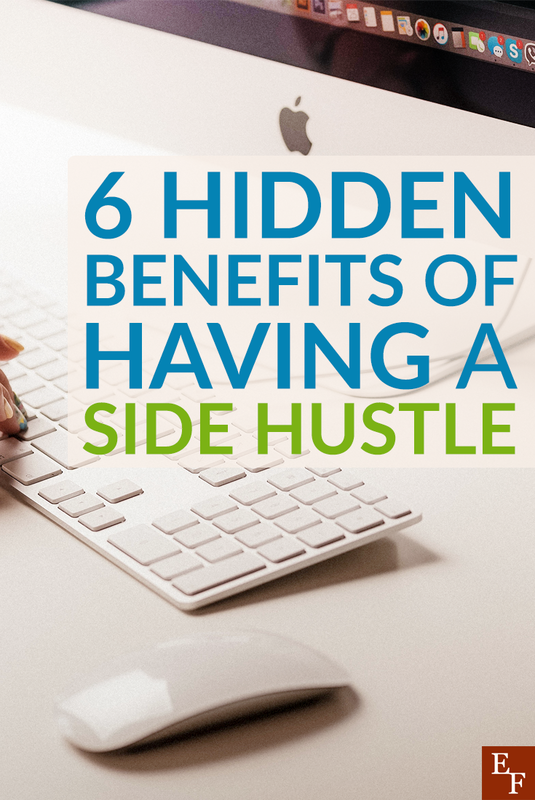 However, side hustles can provide you with so much more than you might realize. Here are six secret side hustle benefits. While there are those select few that can fully support themselves on their passions and creativity, for the rest of us, it’s often times just not feasible. In fact, if you’re like a large portion of the population, you probably don’t find your day job fulfilling. Maybe you can’t wait for the clock to hit 5 p.m. so you can go home and relax a few hours a day away from work. If there’s another part of your life that your passionate about, a side hustle can provide you with a way to use your creativity. Whether it allows you to write and blog, cook, sew, or design, your side hustle can allow you to utilize skills that would otherwise go to waste. Even if you’ve been writing all your life or think you know your sewing machine backwards and forwards, side hustles have the inevitability to increase your skillset in some way or another. As you grow a business, you’ll undoubtedly grow or develop as you likely enter into unchartered territory. For example, maybe your side hustle forces you to learn how to create your own website or manage your businesses social media network. Whatever the skill might be, they’re attributes that can help benefit you professionally all-around. You’ll likely be able to improve your resume or have an opportunity to take on new tasks at your day job through your side hustle. That being said, you might want to err on the side of caution when discussing any side jobs with your employer. Some aren’t particularly keen on extra jobs, especially if they ever feel like it impedes you during their time. Moreover, often times at our jobs or within our departments, we’re surrounded by like-minded individuals that can sometimes stunt our professional growth. Having a side hustle can help you network and meet myriad new people. Your side hustle puts you in places you’d otherwise not go, causing you to meet people you wouldn’t on a regular basis. Whether that’s through customers or vendors, a side hustle can help you connect with a wide array of people. And even if a connections benefit might not seem obvious at first, you’d be surprised who might know who or be able to provide a good word for you. Unfortunately, unlike forty years ago, lifetime job security isn’t always as prevalent as it once was. Relying on one, sole income, while often the norm, can at times be the unwise thing to do. With the changing digital age, you never know what jobs or companies could become obsolete, which is why having a backup plan or at least a cushion is always a great idea. Even with an emergency fund, having an extra source of income can not only put you more at ease and alleviate some of the pressure should you ever be in a situation where you’re laid off, but can also keep you from touching your precious savings. Plus, having an another income can also help you make career and life moves that you might otherwise not make since it’d normally mean going without a paycheck. Ok, so this falls a little in-line with money, but it’s still a benefit you might not have considered. Since some people take on a side hustle to provide themselves with extra entertainment money, it can sometimes cause us to forget that it can help us save up for other financial goals more quickly. Maybe you’d like to take a much-needed vacation, are in dire need of a new car, or would simply love to buy a new handbag. Whatever the reason, having a side hustle can help you save a lot quicker. This is especially true if none of the extra income goes towards daily expenses. Plus, it can prevent you from taking out loans or using a credit card. Things, that while they might not be completely unavoidable in life, are financial moves you likely want to keep to a minimum. One of the biggest benefits of a side hustle is that you never know where it could lead you. It can provide you with an opportunity to dabble in an art or passion you might otherwise not have and create career inspiration that you never thought possible. A side hustle could unexpectedly be successful and lead you a full-time job that you truly love. Money isn’t everything in a job. But unfortunately, you do need a fair amount of it to live. This is why many of us end up in jobs that we usually find lackluster. Ergo the side hustle. Whether you begin one to make extra income or just because you want to, a side hustle can have even more benefits than you might have imagined. And once you start, you never know where it could lead you. What are some side hustles benefits you have heard about? Does it provide you with sufficient income?